In the present paper an attempt has been made to find out the spatio-temporal variation in the adaptation of improved agricultural practices to ascertain the level of agricultural development in Dehradun district of Uttarnchal. The study is based on the block-wise published data obtained from Statistical Bulletin of Dehradun district. The spatio-temporal pattern of agricultural development is determined with the help of thirteen variables. Beside this, the analyses have been carried out by transforming and combining the data related to thirteen variables, using ‘Z’ score to get the composite score. On the basis of Composite Score, developments of blocks have been categorized into three categories i.e. high, medium and low. Results of the aforesaid analysis shows that the modern technological inputs have reciprocal relationship with agricultural development in the study area. Cropping intensity, Irrigation intensity, Agricultural workers, Development blocks and Agricultural development. Alam, S.M., 1974. Planning atlas of andhra pradesh. Survey of India, Hyderabad: 3. Banerjee, B., 1969. Essay on agricultural geography’. A Memorial volume to B.N. Mukherjee, Calcutta. Datt, R. and K.P.M. Sundharam, 2009. Indian economy. New Delhi: S. Chand & Company Ltd.
Krishan, G., 1992. The concept of agricultural development. New Delhi: Dynamics of Agricultural Development, concept publishing company. Maity, B. and B. Chatterjee, 2006. Impact of modern technology on foodgrain production in west bengal: A econometric analysis. Indian Journal of Regional Science, 2(38): 96. Mellor, J.W., 1967. Toward the theory of agricultural development, agricultural development and economic growth. New York: Ithaca Cornell University Press. Ministry of Finance, 2011. Economic survey 2011–12. Mitra, A., 1967. Levels of regional development in india, census of india. New Delhi: Indian Statistical Institute. Mohammad Ali, 1979. Land tenure, a hazard in agricultural development in dynamics of agricultural development in india. New Delhi: concept Publishing Company. Mohammed, A., 1980. Regional imbalances in levels and growth of agricultural productivity - a case study of assam. The Geographer, Aligarh Geographical Society, Aligarh. Nath, V., 1969. The growth of indian agriculture’ a regional analysis. Geographical Review, 59: 369-375. Pal, M.N., 1975. Regional disparities in the level of development in india. 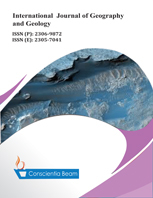 Indian Journal of Regional Sciences, 1(8): 35-52. Peter, T., 1988. The agricultural transformation. Handbook of Development Economics, Elseveir, Amsterdam. Ranganathan, V., 2003. World bank and india?s economic development. Economic and Political Weekly, 3(38): 236-241. Report of the Royal Commisssion on Agriculture in India, 1928. Govt central press Bombay. Sharma, P.S., 1971. Agricultural regionalisation of india. New Delhi: Economic and Socio-cultural Dimensions of Regionalisation. Registrar General. Shenoi, P.V., 1975. Agricultural development in india. New Delhi Vikas Bhawan.